Spirax-Sarco model 211/6 inverted bucket trap with a 1/2" NPT connection and a vertical piping configuration for service up to 250 psi. Spirax-Sarco Series 200 bucket traps feature an inverted bucket mechanism which responds to the difference in density between steam and condensate. This trap discharges cyclically; condensate and non-condensibles are discharged close to steam temperature. Spirax-Sarco model 211/7 inverted bucket trap with a 1/2" NPT connection and a vertical piping configuration for service up to 200 psi. Spirax-Sarco Series 200 bucket traps feature an inverted bucket mechanism which responds to the difference in density between steam and condensate. This trap discharges cyclically; condensate and non-condensibles are discharged close to steam temperature. Spirax-Sarco model 211/8 inverted bucket trap with a 1/2" NPT connection and a vertical piping configuration for service up to 120 psi. Spirax-Sarco Series 200 bucket traps feature an inverted bucket mechanism which responds to the difference in density between steam and condensate. This trap discharges cyclically; condensate and non-condensibles are discharged close to steam temperature. Spirax-Sarco model 211/10 inverted bucket trap with a 1/2" NPT connection and a vertical piping configuration for service up to 60 psi. Spirax-Sarco Series 200 bucket traps feature an inverted bucket mechanism which responds to the difference in density between steam and condensate. This trap discharges cyclically; condensate and non-condensibles are discharged close to steam temperature. Spirax-Sarco model 211/12 inverted bucket trap with a 1/2" NPT connection and a vertical piping configuration for service up to 30 psi. Spirax-Sarco Series 200 bucket traps feature an inverted bucket mechanism which responds to the difference in density between steam and condensate. This trap discharges cyclically; condensate and non-condensibles are discharged close to steam temperature. Spirax-Sarco model 212/7 inverted bucket trap with a 3/4" NPT connection and a vertical piping configuration for service up to 250 psi. Spirax-Sarco Series 200 bucket traps feature an inverted bucket mechanism which responds to the difference in density between steam and condensate. This trap discharges cyclically; condensate and non-condensibles are discharged close to steam temperature. Spirax-Sarco model 212/8 inverted bucket trap with a 3/4" NPT connection and a vertical piping configuration for service up to 200 psi. Spirax-Sarco Series 200 bucket traps feature an inverted bucket mechanism which responds to the difference in density between steam and condensate. This trap discharges cyclically; condensate and non-condensibles are discharged close to steam temperature. Spirax-Sarco model 212/10 inverted bucket trap with a 3/4" NPT connection and a vertical piping configuration for service up to 120 psi. Spirax-Sarco Series 200 bucket traps feature an inverted bucket mechanism which responds to the difference in density between steam and condensate. This trap discharges cyclically; condensate and non-condensibles are discharged close to steam temperature. Spirax-Sarco model 212/12 inverted bucket trap with a 3/4" NPT connection and a vertical piping configuration for service up to 60 psi. Spirax-Sarco Series 200 bucket traps feature an inverted bucket mechanism which responds to the difference in density between steam and condensate. This trap discharges cyclically; condensate and non-condensibles are discharged close to steam temperature. Spirax-Sarco model 212/16 inverted bucket trap with a 3/4" NPT connection and a vertical piping configuration for service up to 30 psi. Spirax-Sarco Series 200 bucket traps feature an inverted bucket mechanism which responds to the difference in density between steam and condensate. This trap discharges cyclically; condensate and non-condensibles are discharged close to steam temperature. Spirax-Sarco model 213/12 inverted bucket trap with a 1" NPT connection and a vertical piping configuration for service up to 250 psi. Spirax-Sarco Series 200 bucket traps feature an inverted bucket mechanism which responds to the difference in density between steam and condensate. This trap discharges cyclically; condensate and non-condensibles are discharged close to steam temperature. 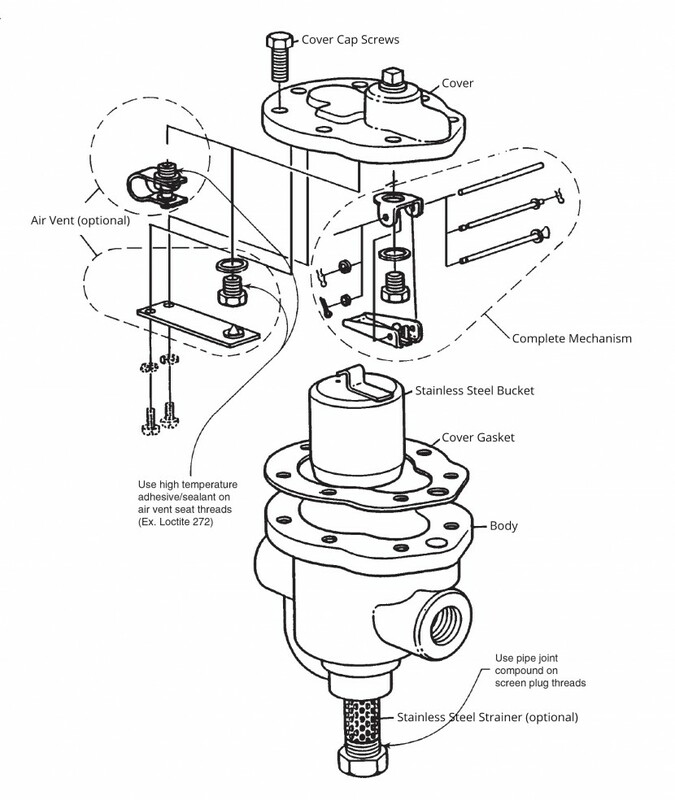 Spirax-Sarco model 213/14 inverted bucket trap with a 1" NPT connection and a vertical piping configuration for service up to 200 psi. Spirax-Sarco Series 200 bucket traps feature an inverted bucket mechanism which responds to the difference in density between steam and condensate. This trap discharges cyclically; condensate and non-condensibles are discharged close to steam temperature. 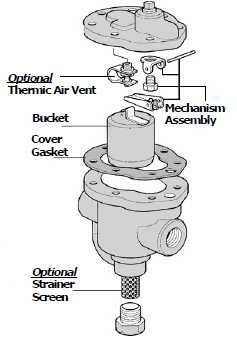 Spirax-Sarco model 213/16 inverted bucket trap with a 1" NPT connection and a vertical piping configuration for service up to 120 psi. Spirax-Sarco Series 200 bucket traps feature an inverted bucket mechanism which responds to the difference in density between steam and condensate. This trap discharges cyclically; condensate and non-condensibles are discharged close to steam temperature. Spirax-Sarco model 213/20 inverted bucket trap with a 1" NPT connection and a vertical piping configuration for service up to 60 psi. Spirax-Sarco Series 200 bucket traps feature an inverted bucket mechanism which responds to the difference in density between steam and condensate. This trap discharges cyclically; condensate and non-condensibles are discharged close to steam temperature. Spirax-Sarco model 213/24 inverted bucket trap with a 1" NPT connection and a vertical piping configuration for service up to 30 psi. Spirax-Sarco Series 200 bucket traps feature an inverted bucket mechanism which responds to the difference in density between steam and condensate. This trap discharges cyclically; condensate and non-condensibles are discharged close to steam temperature. Spirax-Sarco model 215/18 inverted bucket trap with a 1-1/2" NPT connection and a vertical piping configuration for service up to 250 psi. Spirax-Sarco Series 200 bucket traps feature an inverted bucket mechanism which responds to the difference in density between steam and condensate. This trap discharges cyclically; condensate and non-condensibles are discharged close to steam temperature. Spirax-Sarco model 215/20 inverted bucket trap with a 1-1/2" NPT connection and a vertical piping configuration for service up to 200 psi. Spirax-Sarco Series 200 bucket traps feature an inverted bucket mechanism which responds to the difference in density between steam and condensate. This trap discharges cyclically; condensate and non-condensibles are discharged close to steam temperature. Spirax-Sarco model 215/22 inverted bucket trap with a 1-1/2" NPT connection and a vertical piping configuration for service up to 120 psi. Spirax-Sarco Series 200 bucket traps feature an inverted bucket mechanism which responds to the difference in density between steam and condensate. This trap discharges cyclically; condensate and non-condensibles are discharged close to steam temperature. Spirax-Sarco model 215/28 inverted bucket trap with a 1-1/2" NPT connection and a vertical piping configuration for service up to 60 psi. Spirax-Sarco Series 200 bucket traps feature an inverted bucket mechanism which responds to the difference in density between steam and condensate. This trap discharges cyclically; condensate and non-condensibles are discharged close to steam temperature. Spirax-Sarco model 215/36 inverted bucket trap with a 1-1/2" NPT connection and a vertical piping configuration for service up to 30 psi. Spirax-Sarco Series 200 bucket traps feature an inverted bucket mechanism which responds to the difference in density between steam and condensate. This trap discharges cyclically; condensate and non-condensibles are discharged close to steam temperature. Spirax-Sarco model 216/24 inverted bucket trap with a 2" NPT connection and a vertical piping configuration for service up to 250 psi. Spirax-Sarco Series 200 bucket traps feature an inverted bucket mechanism which responds to the difference in density between steam and condensate. This trap discharges cyclically; condensate and non-condensibles are discharged close to steam temperature. Spirax-Sarco model 216/32 inverted bucket trap with a 2" NPT connection and a vertical piping configuration for service up to 120 psi. Spirax-Sarco Series 200 bucket traps feature an inverted bucket mechanism which responds to the difference in density between steam and condensate. This trap discharges cyclically; condensate and non-condensibles are discharged close to steam temperature. Spirax-Sarco model 216/40 inverted bucket trap with a 2" NPT connection and a vertical piping configuration for service up to 60 psi. Spirax-Sarco Series 200 bucket traps feature an inverted bucket mechanism which responds to the difference in density between steam and condensate. 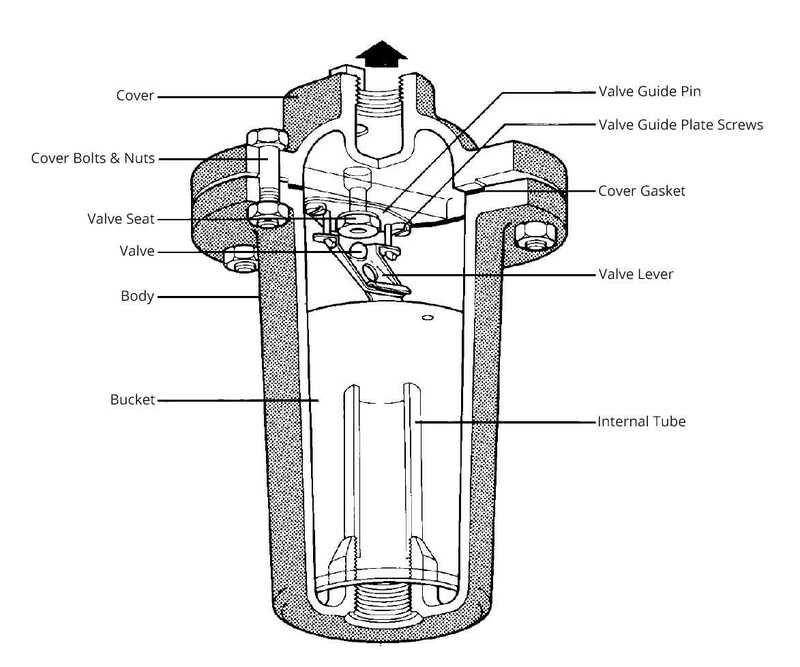 This trap discharges cyclically; condensate and non-condensibles are discharged close to steam temperature. Spirax-Sarco model 216/48 inverted bucket trap with a 2" NPT connection and a vertical piping configuration for service up to 30 psi. Spirax-Sarco Series 200 bucket traps feature an inverted bucket mechanism which responds to the difference in density between steam and condensate. This trap discharges cyclically; condensate and non-condensibles are discharged close to steam temperature.